The Adam pattern, dating to the 1940's has a pristine white body with a rim artfully decorated with Grecian urns, connected by a beaded swag design. At the very rim there is a leaf like design. 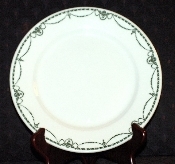 The Warwick China Co Restaurant Ware Adam Green Salad Plates measure 7-1/4 inches in diameter. Each of the available Warwick China Co Restaurant Ware Adam Green Salad Plates is in Mint condition with no chips, cracks or discoloration. The graphics are crisp, the colors vibrant. The plates appear to have been very gently used, if used at all. The Warwick China Co Restaurant Ware Adam Green Salad Plates are marked with "Adam Pattern, Warwick China, Design Patented". Some of the plates also have a year, ranging from 1943 to 1947.